Welcome to July 2015! I hope it’s going well for everyone. I loved reading (and rereading) science fiction stories by Isaac Asimov and Arthur C. Clarke as a kid, and wanted to someday write a science fiction story that would express my admiration for their stories. I’m too close to my own work, so I can’t say if I succeeded in showing my admiration for Clarke and Asimov. I hope so. The story is out this month, and available to read in full online for free, in the July 2015 issue of Crossed Genres Magazine. I hope you will click on over and read about Dr. Melaine Sharps at New Mexico Tech and a rather unusual alien species. Dr. Sharps (the main character) just happens to have autism, and I am extremely grateful to all the people on the spectrum I’ve known over the past ten years who helped me do a realistic story about how it feels to be autistic. While you’re over at Crossed Genres, check out the other July stories too. Hello! I hope you all are having a terrific June. 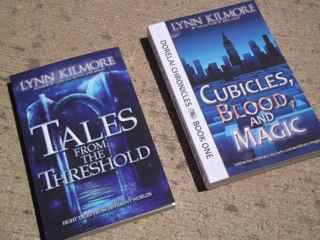 I’m happy to announce that print editions of Tales from the Threshold and Cubicles, Blood, and Magic are being released this month. I got two of the first print copies, and they look great. These print editions are important for another reason–they had to be done before new novels of mine could be published. From now on, my new releases will be in both e-book and print formats. The sequel to Cubicles is up next in the pipeline … as well as a surprise. Oh, and I’ve sold a science fiction short story to a respected market, and it is scheduled to be published this year. More on that once it gets closer to being available. Also, a short story in the Dorelai Chronicles universe, A Maze of Cubicles, is available to download for free from various e-bookstores. Spring came early to the Southwest this year, and I’m taking a quick break from writing to share it with you. The lilac bush is on the verge of bursting forth with blossoms. It smells wonderful when you stand underneath it. The cherry trees are in full bloom. They’re beautiful. Here’s two pictures of what you would see if you stood under the cherry trees and looked up through the branches. Spring has returned, and I am glad to see it. P.S. My activity on blogging and social media has gone down to almost nothing because I am hard at work on finishing the edits to the sequel to Cubicles, Blood, and Magic. The finish line is in sight, though it’s beginning to look like the novel will still come in at 1/3 longer than the first book. There’s still quite a few weeks to go until spring arrives, but today I decided to share some photos from last spring to get one in the mood for its arrival. Each year we get a lot of daisies in the back yard, which survive the entire summer despite the dry heat. Spring will be here soon. Until then, keeping dreaming of it.